Continuing down my path, today's post is about removing the sliding door. Sure, the Bentley has a section about it (5.11), but like the front-door window removal, there's always a little something to clarify. We start with the splash guard that covers the rail running underneath the rear window. The Bentley (section 5.10) is right in that there are 3 fasteners to concern yourself with, but at least in my case, one of the Phillips-head screws in the Bentley picture is actually a bolt and nut. The first 2 are obvious. They are Phillips head screws and come from below the guard at the rear and just front of the middle. Depending on your individual case, you may need to hit these with PB Blaster to get them to come free. At the front, there is a difficult-to-access nut. This is not shown in the picture in the Bentley. At least on my 1972, there is a Phillips head bolt head inside the bus that threads through to a 10mm nut where the Phillips head screw is in the Bentley picture. If you put a 10MM crescent or box-end wrench on the nut, you can remove the bolt from inside using a Phillips head screwdriver. This is not in the Bentley instructions. Once the fasteners are removed, tap on the underside of the cover with a rubber mallet. It should free relatively easily. Within the instructions in the Bentley, a cinch-down bolt and bar is pictured. It has a Phillips head, and should be loosened first. In my case, no amount of PB-Blaster would free the cinch-down bar before I got the cover removed. There is a simple seal between the cover and the side of the bus body. When the cover comes free, this seal will come free with it. The existing one looks fair, but a pair of replacements would be $15 at BusDepot (see here). I tossed it into the keep pile, delaying the decision until the other end of the painting effort. Once the splash guard is off, removing the door is actually pretty easy, but you need a buddy. Again, though, the Bentley falls just a little short. Maybe it's my reading of it (section 5.11). Before you start pulling the door off, there is one step the Bentley forgets: removing the rear catch. If you slide the door all the way open, the inner handle catches on a bracket. That bracket needs to be removed before you try to remove the door. It is held on with 3 thick Phillips-head screws. Now, like the book says, open the door halfway. There is a break in the channel in which the rear support runs. The rear support slips through that opening. 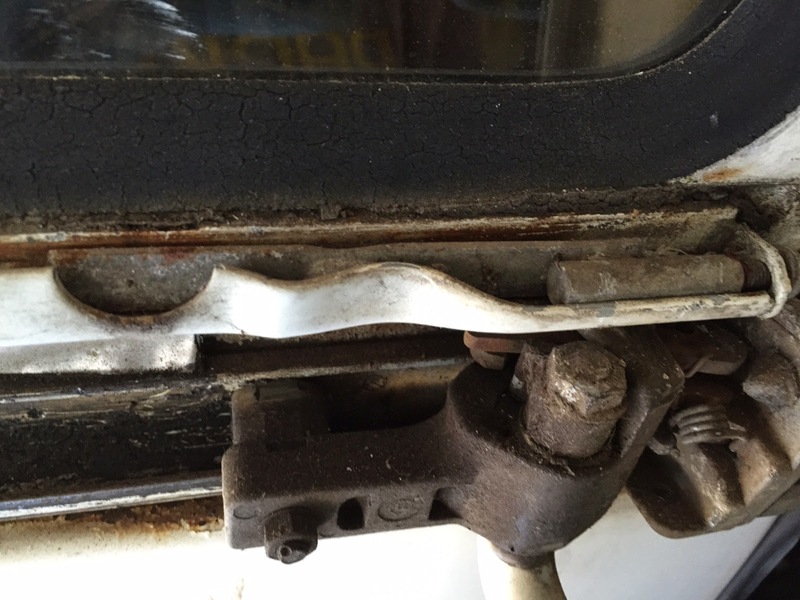 Have your buddy hold that end of the slider, taking care to keep the rear support from banging against the side of the bus. The two of you now roll the door all the way to the rear. While holding the rear-end of the sliding door (and facing the side), have your buddy take a single step back away from the bus. Then, while you hold the front edge, your buddy lifts upward, tilting the door. Keep tilting until the front top roller can slip out of the upper channel. Hold the door firmly now and pop the bottom roller out through the gap in the bottom channel (picture 5-37 might help). Set the door on something stable that won't scratch it. I used the passenger seat I'd removed and set against the side of the bus. With the slider fully removed, you can see all of the little rust spots which were barely visible before you removed it. The bottom edge of my door had a fair amount of surface rust, but no holes. The edge of the body, however, wasn't quite as fortunate. The front corner of the door, under the seal, has some rust spots and a few tiny holes. Some work with a Dremel got the rust removed and the holes clarified, but I need to think about how I can contain the inner side of the rust hole so the rust doesn't spread. Something I'll have to figure out soon. 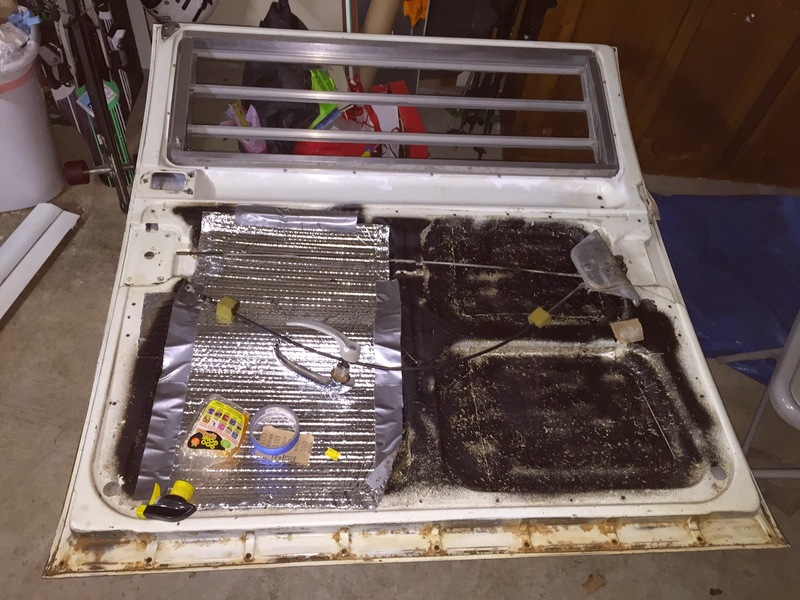 I removed the door workings to make sure no rust had appeared underneath them. Other than the bottom edge, the door looks clean. I scuffed the paint and got after the rust. More work is needed there before the door is ready. The lower roller channel was filthy. 40 years of mud, oil and grease had made quite a mess. Using a putty knife, I scraped the bulk of it off. Then, with Goop-Off, I scrubbed it clean enough to sand without grime gunking up the sandpaper. Happy to see there wasn't any rust (just patina), I lightly sanded the lower roller channel. Last, the body panel under the door had some caked on grey gunk that looked like concrete. Neat. After chiseling off the worst of it, I sanded the rest and roughed up the paint. The drip rail on the bottom had some surface rust, but no holes, and nothing remotely structural. A moderate sanding effort later, that area is ready for priming and painting. 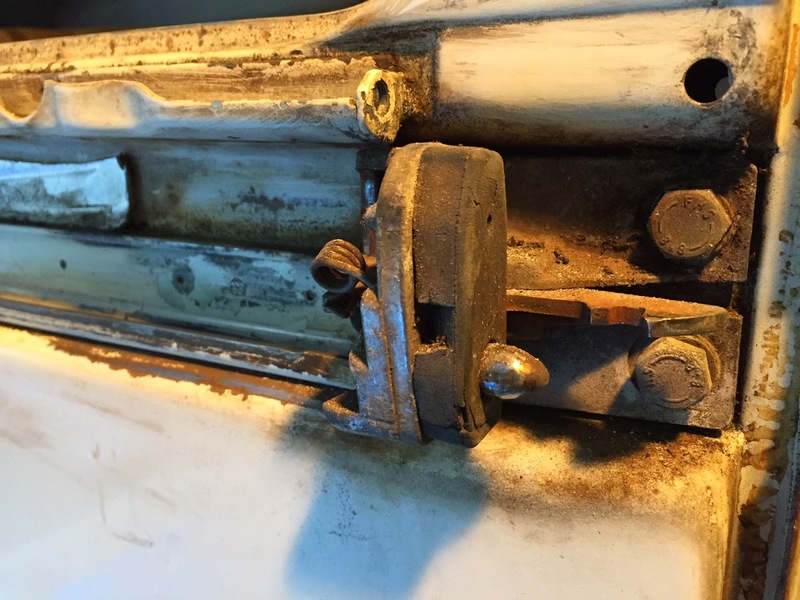 I removed and sanded the cinch-down bar, concluding that it will need paint to keep it from being patient 0 for the next round of rust in the slider area. I'm not sure it will work as well with paint on it, so I will look for a new replacement. That's it for today. I still have to finish the rust sanding on the slider, but otherwise the door and door opening are ready for the next step. As always, thanks for following along.